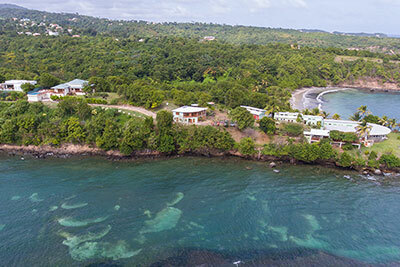 Two Bays Beach Villa compromises the One Bedroom Ocean View Apartment and two self-contained Studios - Crochu Bay Studio and Cabier Beach Studio. 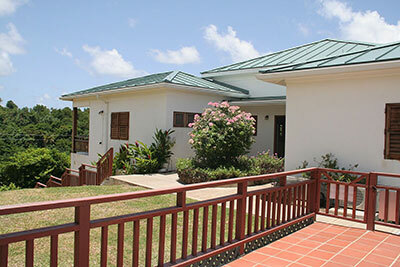 They can be booked separately or as one Three Bedroom Villa*. They are designed in an elegantly casual style and fully equipped to cater to your needs. At 60 feet above the water they each offer privacy and stunning ocean views. There are no glass windows or doors, the wooden louvres and fans allow the cooling breeze to circulate so air conditioning is not normally required. Furniture and fittings are built from sustainable hardwood. 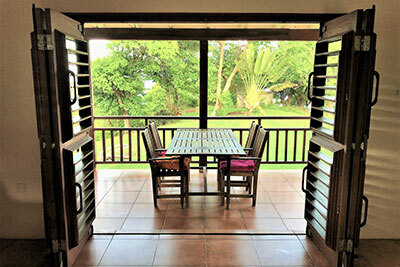 Wide folding louvered doors open out to large private verandas offering the perfect area for dining and relaxing. 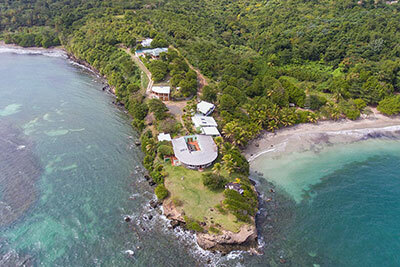 Two Bays is all about enjoying a natural, rural environment and experiencing an authentic and untouched Caribbean. 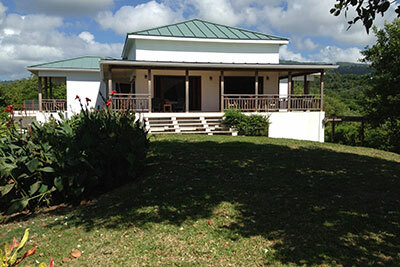 The Apartment features 100ft long deep veranda with seating, double swing seat and dining table, large living and dining room, kitchen and breakfast bar. The large bedroom features a super king size four poster bed, en-suite bathroom with shower. 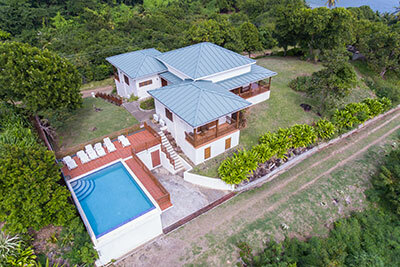 Crochu Bay Studio and Cabier Beach Studio are self-contained and each feature a 20ft long private veranda with swing seats, dining table, kitchen, en-suite bathroom with shower. The One Bedroom Ocean View Apartment can be combined with either of the self-contained studios to make accommodation for parties of 3 - 6 persons at special group rates. 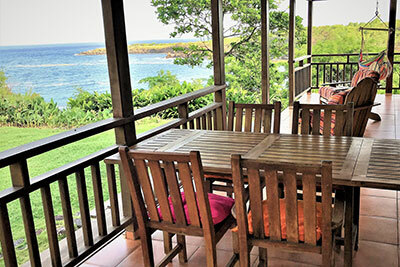 The Studios even when linked with the Ocean View Apartment, provide private space as well with their own 20 feet long shaded verandas. 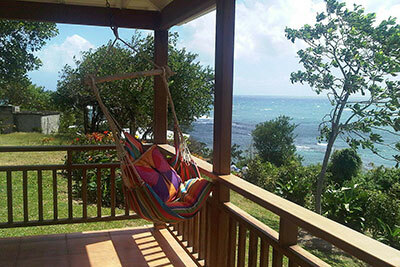 Cabier Beach Studio links internally with the Ocean View Apartment. 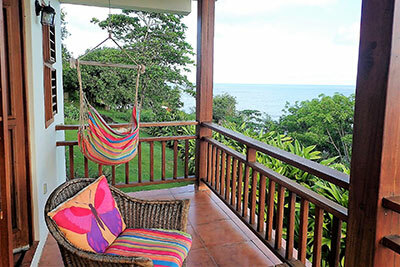 The swing seats on the verandas let you gently swing with your feet up and look at the ocean to watch pelicans fishing, frigate birds circling overhead, with occasional glimpse of the locally nesting ospreys fishing; as well as other bird life, including humming birds, in the garden. 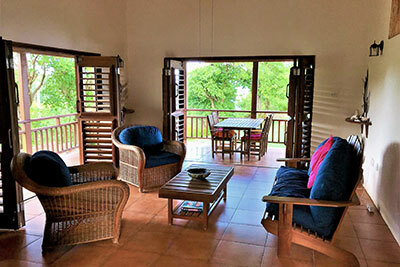 Each room has folding wooden doors, giving you outdoor living even when inside Two Bays. The louvers on the doors are adjustable to collect the breeze even when the doors are shut and there are large ceiling fans. 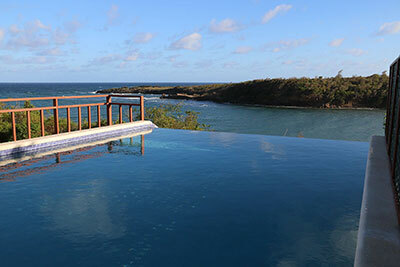 Two Bays infinity swimming pool together with its sun terrace is private and has superb views over Crochu Bay and the ocean. 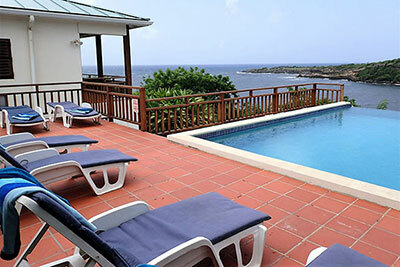 The pool and grounds are exclusive to Two Bays guests (max 6). 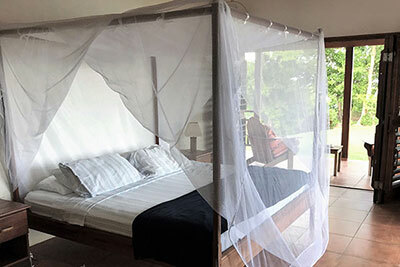 Air conditioning is available in the bedroom if required at a small nightly extra charge, but Two Bays Villa and Studios are perfectly positioned with its louvered doors to catch the balmy breezes that gently blow over the area off the sea helped by the large ceiling fans. 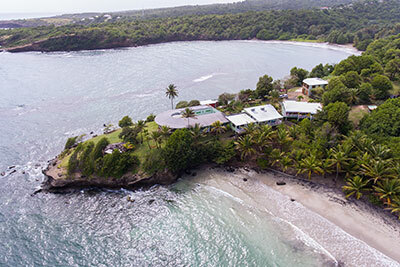 Two Bays Beach Villa is 100 yards from Cabier's beautiful natural beach and Cabier Ocean Lodge with its Terrace Restaurant and Bar. 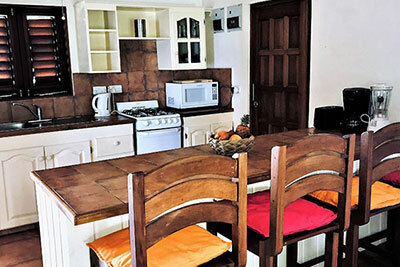 * Families travelling with children aged 18 and under must book the entire villa.